sock prØn. 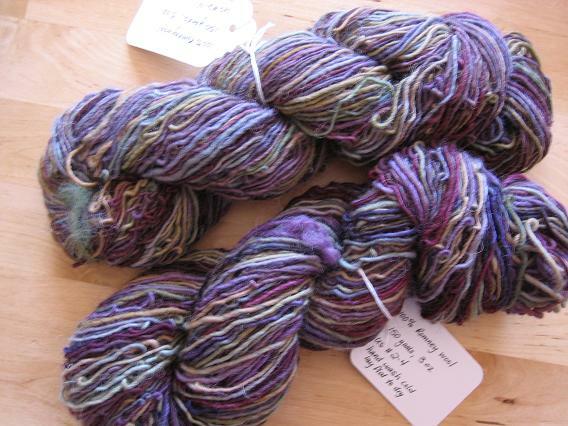 : Hedera, handspun, happy yarn serendipity! 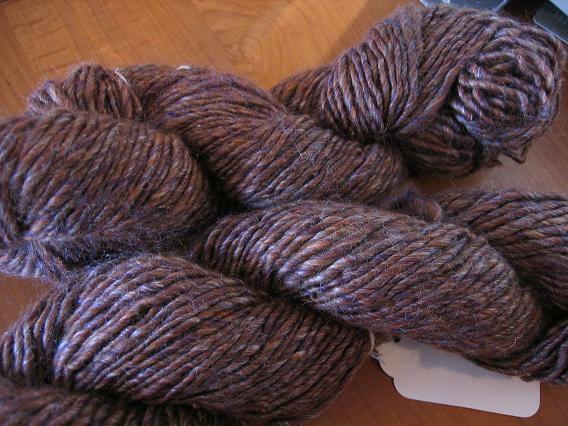 Hedera, handspun, happy yarn serendipity! And almost as cool as an unexpected $100 yarn spree... (not as cool cos I was waiting for it so hard!) 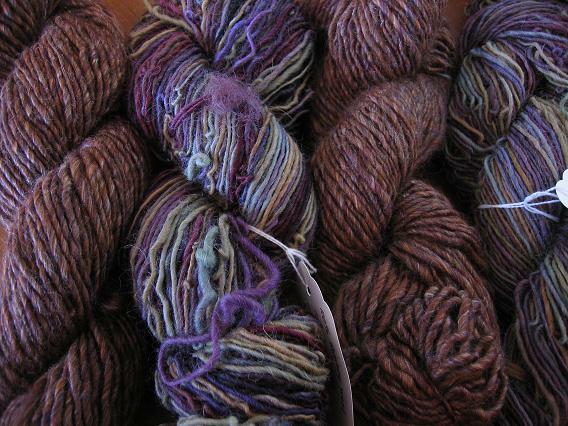 -- handspun sock yarn. Yup. Man, after all that, my Hedera's aren't nearly as thrilling, eh? I can't get a non-shaky shot to save my life today, it seems! 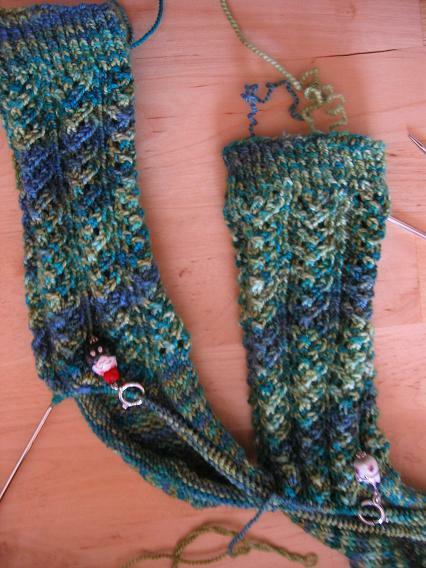 I'm at the gusset decreases, and have worked the pattern as written except for picking up the stitches at the sides of the heels-- now, I always pick up the back loop of the slipped stitch with a seperate needle and then knit that loop tbl. So I've done that, *and* I've knit the following stitch round tbl as Cookie directs in her pattern, makes a cool twist at the side (I'll post a pic of that next time, easier when I've gotten further on the foot). I love how its used in both this pattern and Pomatomus; it always is so tight looking, and really stands out (literally). Next Row [WS]: Sl 1, [p1, sl 1] to end. Congratulations on the win! The Hederas are indeed lovely ... very nice pattern which shows well in the variegated yarn. I saw that post over at Jason's as well. Personally, I don't think it matters. 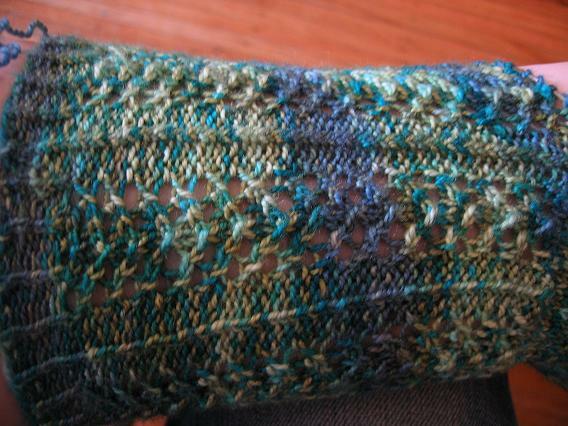 Socks are a spiral, and the spiral has to, well, spiral someplace, so why not the heel. It will be interesting to read your thoughts when you put these socks on as to whether you can tell a difference. Congrats on winning the yarn spree! Congrats on your win! Looking forward to seeing what you choose. Hedras are looking great. Can't wait to start a pair for myself! Oh, just to add. There is a little bit of difference in the ease of picking up stitches though. $100 worth of yarn? "Shut. UP." is completely appropriate. Have fun picking out loot. Hedera looks great! I'm in love with your Hedras! The color and the pattern look great together. Congrats on winning the contest! Re Hedera heel pattern. The only reason I have for slipping on the purl side is because I'm soooo much slower at purling, so I like to do all the slipping on that side and leave all the fast knitting on the other side. I'm really interested to see what the HA looks like with more of it than the little 6" one I have. Fingers crossed the twist is tighter! The Hederas are beautiful - maybe for my CTH I'll end up doing those too! Congrats on winning!! WOOOHOOO more yarn! veyr cool st markers too!